Even as an adult, I anticipate my Christmas stocking every year. My husband always succeeds in finding a handful of gifts that are the perfect balance between practical and perplexing. Early in our marriage, the gifts were mostly useful toiletries: a 500-count box of Q-tips, shampoo, and toothpaste. Over the years, however, he has left the bathroom in favor of the kitchen, with most welcome results. A few of the gifts never change. I bank on English breakfast tea in bulk, a bottle of olive oil, two bags of dark chocolate peanut M&Ms (I’ve mentioned my sweet tooth in the past! ), and peppercorns for our pepper mill. Over the years, I have also received jumbo jars of pepperoncini (his favorite) and food items ranging from bags of fried fava beans and yellow lentils to a tin of Virginia peanuts and a box of ice cream cones (yes…that sweet tooth again). There is no need for these gifts to actually fit in the stocking, by the way. They are typically stacked in a neat pile on the floor below. So why am I writing about Christmas stockings when we will soon be thinking about Easter baskets? Along with the variety of edibles, there are usually a couple of magazines. I rarely buy magazines for myself, so this is always a treat. This year, a recipe from British chef Jamie Oliver popped out from one of the pages. “Chicken in Milk” was odd yet intriguing, and I cooked it right away. The aroma was amazing, and the chicken ranked with the most tender I’ve ever consumed. I made the recipe several more times, dialing back the tanginess of the sauce and simplifying the preparation. Though my family loved this tender chicken the first time, with each revision they adored it a little more. Each time I prepare this recipe, I increase the amount of garlic over the original amount, listed below. The whole cloves soften and mellow as they cook, and everyone requests more of these creamy nuggets. 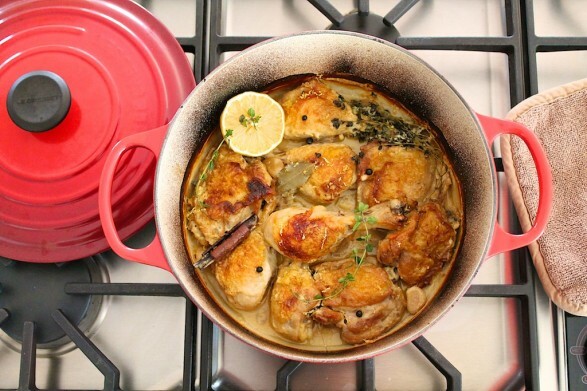 Preheat the oven to 375 degrees F. Heat the olive oil over medium heat in a Dutch oven or another heavy pot or casserole with a tight-fitting lid. Place the chicken, skin-side down, in the pot and allow it to cook without moving until the skin is nicely browned, about 10 minutes. (This step will render much of the fat, brown the skin, and is best done in two batches so as not to crowd the pan. I don’t bother to brown the side with little to no skin. See notes for a timesaving option.) Remove the browned chicken to a plate. Discard the excess oil, leaving the crusty bits on the bottom. This will add good flavor later. Put the chicken back in the pot with the rest of the ingredients, and cook, covered, in the preheated oven for 1 hour and 30 minutes. (I don’t baste or even peek, although I have taken the chicken out after 1 hour and 20 minutes and it was fine. I have also cooked early and reheated.) The lemon juice will sort of curdle the milk, making a thick sauce, which is creamy and absolutely delicious. Serve with crusty bread or over rice, noodles, or potatoes, as desired, to soak up the delicious sauce. A side of peas or green vegetable of choice completes the meal. To see what would happen if I omitted the browning step–which tends to splatter and be a bit messy–I skipped it recently and was pleasantly surprised. While the color of the skin is not golden brown and beautiful, the resulting chicken is every bit as delicious as it is when browned first. This meal is so incredibly easy when the browning stage is skipped…I wouldn’t hesitate to try it this way and compare for yourself. If you don’t typically use 2% milk, which I recommend over non-fat milk in this recipe, look for the 16-ounce bottles to eliminate waste. If your grocery store doesn’t carry this size, many convenience stores do. I love your veggie additions…a brilliant way to make this a one pot meal. Thanks so much for taking the time to let me know! Can’t wait for you to try it with all that yummy garlic, Beverley! Oh my goodness, this sounds like heaven!! one question though…Do you leave the lid on while it’s in the oven? Thanks for sharing!! Thanks, Kim! Yes, do keep the lid on the entire time. I find that a tight-fitting lid helps keep all the moisture in, and the result is extremely tender chicken. Enjoy! I made this years ago but used buttermilk and it was awesome. I’ve been tempted to try with buttermilk, Becky, but keep going back to the lemon! Thanks for your comment! My husband is gluten and dairy free–would it still work with either soy or almond milk? I haven’t tried with another milk, Janice. I think I would try coconut milk first–if you like the subtle flavor–but soy and almond would likely create an equally tender chicken. If you try, I’d love to hear what you think. Thanks Ann–will definitely try coconut milk–that sounds good and will let you know! Have you ever tried skim milk? And what about just skinless,boneless, chicken breast? I have not, Chris. The 2% milk gives the sauce a little thickness with limited fat, but you could try skim. Also, cooking with the bone in allows for the longer cooking time–which creates the tender, juicy meat–without drying it out. I would suggest trying without the skin but with the bone as a happy medium. And if you do try, I’d love to know how you make out! Thanks for the comment about the lemon – I was hesitant to add lemon to milk, knowing what can happen! This sounds yummy. Happy it helps…and hope you enjoy! Muchas gracias, Cecelia. Yo se un poco español, pero no es suficiente para escribir mis recetas como este. Lo siento! This recipe is very similar to the Jamie Olivier roasted chicken. Has anyone tried just using breasts? I mentioned Jamie’s recipe above as my inspiration…such a great meal! We like it with a little less lemon, and I have made a few other adjustments as well. If you try with breasts, I think it would be fine…maybe remove from the oven a little sooner as the white meat cooks more quickly that the dark meat. If you use boneless chicken, it would require less time yet, and the sauce may not cook down quite as well. I think the flavor would still be wonderful though. If you try, please report back! This sounds absolutely wonderful. Recently, I tried another Jamie Oliver chicken recipe, and it was the first time following one of his, and I adored it. Looking forward to trying this recipe as well. Pinned! Thank you…the feedback I have received on this recipe has been wonderful, and I hope you like it as well. Feel free to let us know what the other recipe you liked is! Your Chicken in Milk was absolutely amazing! I’ve added it to my file of favorites and am making it again today! Love your newspaper column and website for healthy and delicious meals and just wanted to say THANK YOU! I appreciate the wonderful feedback, Erica…thank YOU! These are the sort of comments that make this little labor of love completely worthwhile! So what happens if you forget the lemon juice ? I have not prepared this without the lemon juice. The flavor would be slightly different although I think the chicken would still turn out juicy and tender. This is sooooo good!! I’ve already made it a second time. Thank you Ann! You are welcome…thanks for letting me know! The chicken fell off the bone it was so tender and moist. My girls do not like dark meat so I will try some chicken breasts next time and not cook it as long as you suggested. Also read that someone added kale and carrots-I may try that next time as well. The flavor was wonderful! Thanks for your comment, Judy. So glad you enjoyed and I look forward to hearing how you and your girls like it with chicken breasts! made it a few weeks back with unsweetened coconut milk and it was DELICIOUS! I added more garlic and thought there was too much pepper. I am making it again tonight for Passover and I’m using even more garlic (it tastes so good and we LOVE garlic) and only 1/4 tsp of pepper. I also added cilantro to it the first time around and really liked that and will do it again tonight! Thanks so much for this recipe is it SO good–one that will become a favorite! I am so happy this was a success and love your tweaks. I adore coconut milk so might just try that way the next time. Thanks for the great comment! Add another fan. My thyme plants are just taking off and the stalks are small, , so I also used fresh parsley, minced. Yay, Carol! And I can’t wait for my thyme plants to grow a little bigger. It’s one of my favorite herbs! Something about this recipe caught my eye on Pinterest. I thought I would give it a try, keeping in mind that my daughter is gluten and dairy free. I substituted the milk with unsweetened almond milk as none of us like coconut anything. I bought garlic at the store but it didn’t get put in our bags so I used a lot of granulated garlic instead and a seasoning mix of rosemary and garlic and threw a chopped onion in my dish. I also threw asparagus in the dish. So 1) asparagus got mushy and that was a bad call on my part. I will try carrots next time instead. 2) we need the real garlic as something was just missing a bit. 3) the sauce was very tasty but the almond milk did not get creamy…we all liked it a lot however and 4) even my pickiest kid loved the chicken. We will try it again with a different veggie, real garlic and rice instead of pasta as a side. Thanks for sharing so many good recipes. Thanks for your wonderful comments, Kelly. I’m sure others will enjoy reading the feedback regarding your adaptations. Ultimately, I’m glad the chicken was delicious and you plan to make it again! Ann- this looks yummy and I am just starting to prepare it. I realized after I bought the ingredients that I do not have a Dutch Oven- so have used a stainless Cuisinart pot (big one, like for corn). Its been in the oven at 375 for 10 minutes but is nowhere near brown, nor is it spattering. I am sticking it back in there- a bit and will likely fall back to your note saying its not really a mandatory step. The question is- do I want to invest in a Dutch Oven? Is there a substitute for one? I have a slow cooker. I am not a regular cook, so am always on the fence if I should acquire more kitchen ware or if I can improvise with what I have. Happy to get one if it will add to my ability to cook more/fast! You should be just fine, Viki. If you read the recipe notes, the splattering happens in the messy stovetop step that you can avoid by not browning first. In this case, the skin will be lighter in color, but don’t worry. It will still taste delicious. If something still doesn’t make sense, just let me know. As for the Dutch oven, you should be just fine without one. Although they are nice for certain things, usually a pot with a tight-fitting lid works as a fine substitute. Thank you so much for this great recipe. I usually ‘file’ recipes, but this one I made the same day as you offered it on your website! I followed the recipe fairly closely however I used 2 cups of coconut milk and 1/4 cup of chicken broth to thin it out, instead of the 2 cups of 2% milk, due to a milk intolerance and I used only chicken thighs. I deboned and froze a few dinner portions. I also kept some out to make chicken soup, adding both 16:1 ratio of chicken broth and coconut milk. The soup was also yummy. Thanks again, I shall make this recipe often and share it with my culinary friends! Love that you made this and enjoyed. Your coconut milk substitution sounds delightful, as does the soup. Thanks for your great feedback, Krissie! Very tender! I added some stone ground mustard to the milk as well as a few different spices. I don’t have a Dutch oven so had to improvise. I bet a hint stone ground mustard was wonderful! Sounds great. Can I try it with skinless / boneless? Because of the extended cook time, I would recommend using bone-in chicken but think it would still be very good if you removed the skin. I hope my message finds you very well. 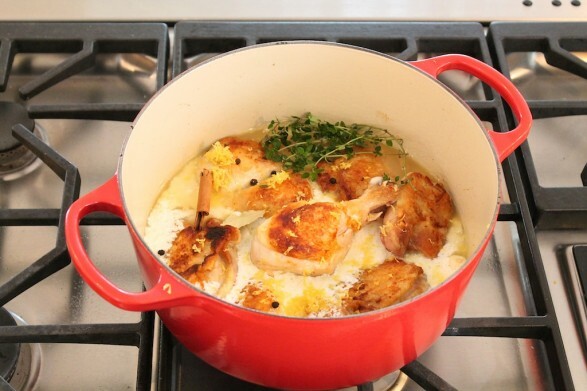 I saw this Chicken in Milk recipe of Jamie Olivers and I was a little apprehensive to try it… however the excited comments on your site have me sold to give this a shot! I do have a question for you please… My husband is a lover of food that boasts heat and spice. How (if at all possible) can i add abit of heat to this dish? Thank you in advance. I think some cayenne pepper would be an easy way to add some heat, Zaakira. It would be fun to experiment with a hot curry paste or harissa, too. Can you use whole milk instead of 2%? Thanks. Hi! Just getting ready to put this recipe together for dinner, and I don’t have any fresh sage leaves. My options are: poultry seasoning, dried rosemary, or dried thyme. Which would be best as a substitute here? Soooooo looking forward to eating this scrumptious-sounding dish later! Thanks! I literally just sat down to catch up on emails and your message popped up! I think any of those options would work well. I usually use thyme (sage is mentioned as the option), so I think I’d go ahead and use that. I hope you enjoy the meal as much as we do! First time I made it it came out so good. The second time my sauce came out really thin. Not sure what I did wrong the second time.. maybe to much milk? How much buttermilk goes in to a 10lb bag of chicken. 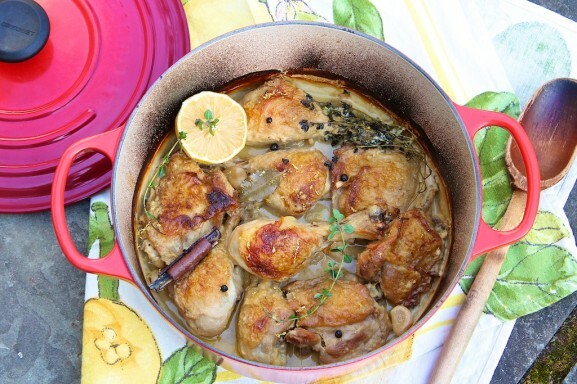 For 10 pounds of chicken, you’d want to triple the recipe…and use a big pot! I’d also be sure to check the doneness with a quick-read thermometer, as the cooking time may need to be extended with a larger batch. Hope that helps! I am trying this in an instant pot. Did it once with a different recipe and it was delicious. Hope this works out as well. Will let you know. I can’t wait to hear how it worked in the Instant Pot! So the pot is not covered in the oven? Hi Anne, It is covered － with a tight-fitting lid as mentioned in the first paragraph. Thank you for your inquiry though, as I did provide additional clarification later in the recipe. Hope you enjoy!